But the bottle is picked up by Theresa, a mother with a shattered past, who feels unaccountably drawn to this lonely man. Who are this couple? What is their story? Beginning a search that will take her to a sunlit coastal town and an unexpected confrontation, it is a tale that resonates with everlasting love and the enduring promise of redemption. 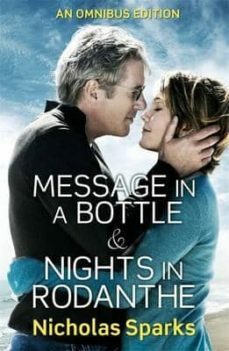 NIGHTS IN RODANTHE Two fragile people. One desperate second chance. Reeling and desolate, Adrienne Willis needs space to rethink her life after her husband leaves her for a younger woman. Fleeing everything, she jumps at the chance to look after her friends guesthouse in the coastal town of Rodanthe, North Carolina. But there is a storm heading for Adrienne, in more ways than she can imagine. Stranded and isolated as the weather closes in, Adrienne has only one guest: Paul Flanner, a man running from his own shattered past. Taking refuge, Paul and Adrienne have only each other to turn to. Against all the odds, their one weekend sets in motion feelings that will resonate through the rest of their lives.